Key FeaturesStainless steel will never rust or corrodeIncludes quality, reusable plastic pit case Includes socket, button, flat head and setscrewsIncludes 177 total fastenersOverviewThe Dynamite® brand is proud to offer stainless steel screw upgrade sets for the Traxxas® SlashTM, Stampede®, Rustler® and BanditTM vehicles. 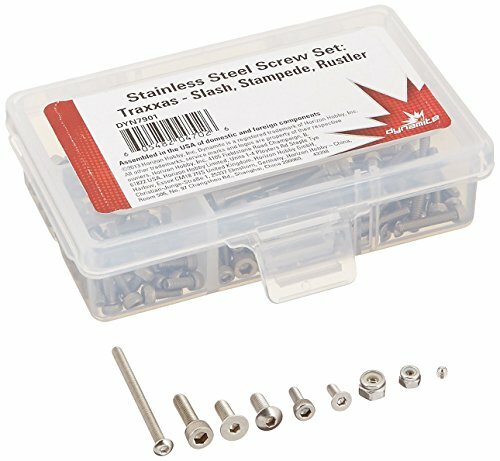 These stainless steel screws are far superior to the stock screws included. Our kits are made with the best stainless steel money can buy. No more bent, rusted or corroded screws or stripped heads again.Traxxas, Slash, Stampede, Rustler and Bandit are trademarks or registered trademarks of Traxxas, L.P. Stainless Screw Kits are 100% complete.Your new kit will include everything needed to do a full conversion and more.Stainless Steel Screw Kits are an upgrade to the screws that come stock with your RC.No more bent, rusted, or corroded screws.Great quality stainless steel material.Included:All socket screws + ExtrasButton Screws + ExtrasFlat Head Screws + ExtrasSet Screws + ExtrasNuts + ExtrasWashers + ExtrasBondhus Short Arm hex wrenches - all needed sizesQuality Reusable plastic pit case.General Traxxas Screw Installation & Notes: Step Pins/Step Screws & Threaded Suspension Pins/Hinges are not included in our screw kits. These parts are patent pending by Traxxas and cannot be reproduced. Use either a wax or grease on the threads to help prevent stripping while going into new or hard material. Some screws that are included in the our kits remain phillips heads but are still stainless steel. We have done this for strength, as a result of our field testing, on small diameter screws (2mm and 2-56" diameter). This may include some chassis screws and differential screws. All other remain socket head. Please refer to your assembly manual for screw locations. 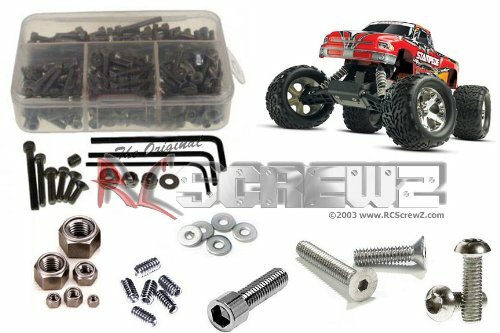 Stainless Steel Screw Kit for the TRA065 - Traxxas Stampede 4x4 TSM (67086-3)......RCScrewZ Stainless Screw Kits are 100% complete. Your new kit will include everything needed to do a full conversion and more. 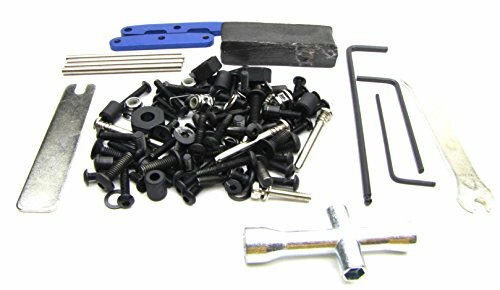 Stainless Steel Screw Kits are far superior to the screws that come stock with your RC. Our kits are made with the best stainless steel money can buy. No more bent, rusted, or corroded screws. Never worry about stripped heads again. You will not find a better screw kit for your RC at any price and we Guarantee it. If for any reason your not 100% satisfied with your kit, return it and we will send you a full refund for the price of the kit. 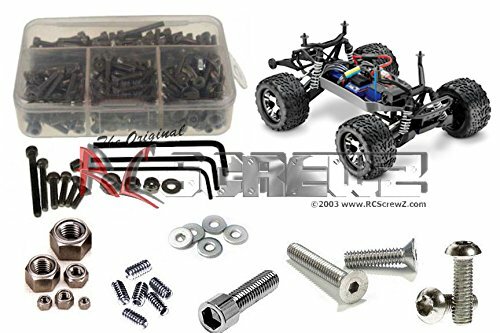 All RCScrewZ Kits include: **All socket screws + Extras, **Button Screws + Extras, **Flat Head Screws + Extras, **Set Screws + Extras, **Nuts + Extras, **Washers + Extras, **Bondhus Short Arm Hex Wrenches All Sizes, **Quality Reusable plastic pit case. Come visit us direct at RCScrewZ and browse our inventory of over 4000+ screw/bearing kits!!!! Stainless Screw Kits are 100% complete.Your new kit will include everything needed to do a full conversion and more.Stainless Steel Screw Kits are an upgrade to the screws that come stock with your RC.No more bent, rusted, or corroded screws.Great quality stainless steel material.Included:All socket screws + ExtrasButton Screws + ExtrasFlat Head Screws + ExtrasSet Screws + ExtrasNuts + ExtrasWashers + ExtrasBondhus Short Arm hex wrenches - all needed sizesQuality Reusable plastic pit case.General Screw Installation & Notes: Use either a wax or grease on the threads to help prevent stripping while going into new or hard material. Some screws that are included in the our kits remain phillips heads but are still stainless steel. We have done this for strength, as a result of our field testing, on small diameter screws (2mm and 2-56" dia). This may include some chassis screws and differential screws. All other remain socket head. Please refer to your assembly manual for screw locations. 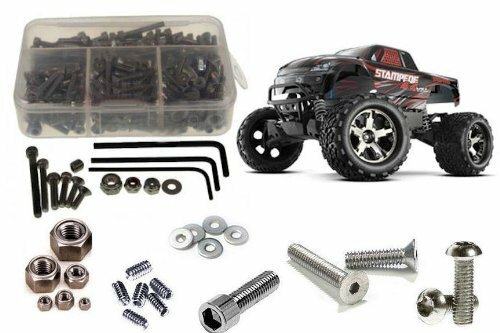 Traxxas 1/10 Stampede 2WD VXL (Model 3607 & 3607L)Screw & Tool KitMSRP: $19.98Local Hobby Shop: $17.99Dollar Hobbyz: Up to 95% Off MSRP! 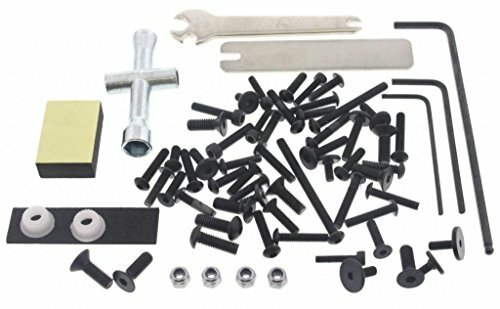 More Truck For Your Buck Since 2002!This Product Includes:60+ Piece Screw and Fastener KitSix (6) Piece Tool Kit (Part # 2748X)This part is fully compatible with all Traxxas Monster Jam 1/10 scale trucks. This includes Grave Digger, Son-Uva Digger, Captain's Curse, Monster Mutt, Maximum Destruction and the Advance Auto Parts Grinder. 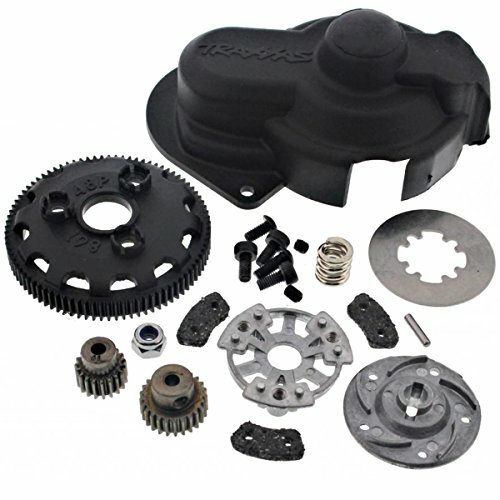 This part is also compatible with the Traxxas Stampede 2wd XL-5 and VXL. It may be compatible with other models as well.This is Not a Complete Screw Kit. Best Used for repairs, and Cannot be Used For Completely Rebuilding Your RC. You already know RPM A-Arms are the toughest molded A-Arms in the R/C industry (Gram for Gram, stronger than aluminum as well)! each RPM A-arm is molded from our trademark blend of nearly indestructible nylons and backed by our world-renowned limited Lifetime warranty against breakage. RPM durability combined with RPM affordability; there’s no way you can go wrong! Tech notes: RPM wide A-Arms for the Traxxas Rustler and Stampede 2WD fit all electric versions of these models, although additional parts (not included) are required for completion as listed here: Rustler XL-5: 1 – RPM screw kit #70680, 1 – Traxxas #3643 (long camber links), 1 – Traxxas #3645 (long toe links) and 1 pair of front wheels (used to replace rear wheels). Stampede XL-5, Craniac and Skully: 1 – RPM screw kit #70680, 1 – Traxxas #3643 (long camber links), 1 – Traxxas #2338 (long toe links) and 1 pair of front wheels (used to replace rear wheels). Rustler VXL: 1 – Traxxas #3643 (long camber links), 1 – Traxxas #3645 (long toe links) and 1 pair of front wheels (used to replace rear wheels). 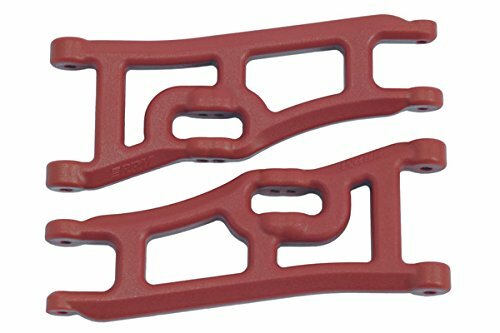 Stampede VXL: 1 – Traxxas #2338 (long toe links) and 1 pair of front wheels (used to replace rear wheels). LIVE WHAT SHOULD YOU BUY TRAXXAS STAMPEDE 4X4 OR STAMPEDE 2WD? 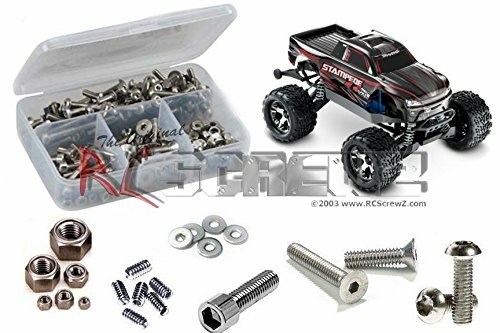 Compare prices on Traxxas Screw Kit Stampede at ShoppinGent.com – use promo codes and coupons for best offers and deals. Start smart buying with ShoppinGent.com right now and choose your golden price on every purchase.